September 12, 2009, Pace Airlines laid off more than four hundred employees this week, its recent round of layoffs have employees baffled. Many of these employees have not been paid and the Department of Labor is now investigating wage and employee complaints. Yesterday the company’s Vice President's car was vandalized and as a result more than one hundred employees were laid off. Pace Airlines believes the vandalism was in retaliation to earlier layoffs this week. In a memo to its employees yesterday the company states, “This morning Mr. Stuart Carnie's personal well being was attacked when his vehicle passenger side window was smashed in with brute force, items stolen, and the interior destroyed. Due to this personal affront on a Pace Airlines, Inc. Executive Officer, I hereby declare the temporary reduction of pace operations effective immediately Flight Operations is instructed to return all Triton leased aircraft to the Pace facilities ASAP. With consideration of everyone's personal safety being first and foremost at all times, and not knowing exactly what party has perpetuated this personal attack on Mr. Carnie or who might next be attacked, all non-essential personnel will be relieved of their duties and responsibilities effective immediately upon notice by their supervisor." Pace Airlines is a charter airline based in Winston Salem, North Carolina. The company operates executive passenger and sports flight charters. Its main hub is located at Smith Reynolds Airport, Winston-Salem. 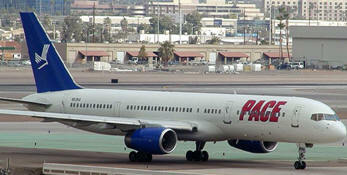 Pace Airlines specializes in Sports Teams, Tour Operators, Corporate Shuttles and Large Boeing Business Jets. The company operates a fleet of Boeing 737-200, 300 and 400 and the Boeing 757. Pace operates scheduled and non-scheduled charters for some of the largest tour operators in the world. In December 2002, the owner of Hooters, Robert H. Brooks, purchased Pace Airlines after the deal with Vanguard Airlines of Kansas City, MO, fell through. Hooters Air was then born. The parent companies are now owned by Kansas City executive William C. Rodgers. Once a promising concept, Hooters Air had succumbed to the fate of most start up airlines since deregulation and ceased operations in the spring of 2006. The certificate holder Pace Airlines fell back to their core business of providing sports and vacation charter flights. Fighting to stay afloat Pace Airlines has more troubles. This week the airlines fight with Direct Air over contract agreements is now in federal court after both sides claiming the other failed to live up to contract agreements. Pace Airlines claims in a lawsuit filed Thursday that Direct Air failed to pay $1.45 million for flight services it provided in the spring. Direct Air reports the lawsuit is a result of the companies decision to cancel its contract with Pace for the reason that Pace Airlines did not provide the type of aircraft it agreed to provide as stated in their agreement. In August of this year, Pace Airlines maintenance division lost a major contract with Continental Airlines. In December 2007, Pace Airlines was granted a contract with Continental Airlines to perform heavy maintenance checks on some of Continental's 737-300 and 500 aircraft as well the company provided installation work for avionics equipment.